In July 1609, Sir George Somers had started with a fleet of 9 ships from Plymouth (England) towards the new English colony Jamestown in Virginia. He was carrying settlers and food supplies for the new colony. As a chief commander, he was aboard the lead ship (or the flagship) called the Sea Venture. There were 150 sailors and settlers aboard the vessels, and a dog. The fleet was caught in a severe storm. The sailors were somehow able to spot the east-end reefs of Bermuda (near St. George) and were able to steer the ship towards the rocks. The ship however got wrecked at the reefs off Gate's Bay (i.e. the bay of St. Catherine's Beach). But luckily all men on board survived including the dog :-). All came ashore and but few were asked to stay back to retain British claim of the newly found island... they started the first human settlement in Bermuda. The survivors later built two new ships - The Deliverance and The Patience. The Deliverance was constructed primarily out the materials stripped from the Sea Venture itself. 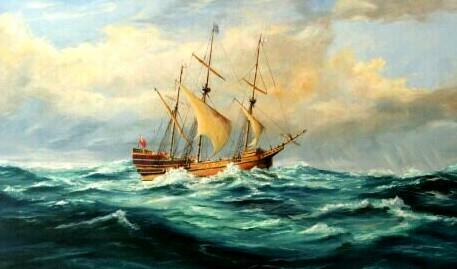 Having built the two new vessels, most of them had set sail again for Jamestown except the few who stayed back. For a long time this 300 ton single timbered ship of London Company sat on top of the reefs and was largely stripped off its cargo and many other parts over time by the early settlers. However whatever remained finally sank and sat below the sea amongst underwater reefs. But the exact location of the wreck remained unknown for a long time. However two canon guns were recovered from the wreck in 1612 and used in the eastern-end military forts built by the British in early 17th century. One can be seen at Castle Island Fort and the other one at Governor's Island fort located opposite to Paget Fort. Nearly 350 years after the Sea Venture got wrecked, Edmund Downing set out to find the Sea Ventures remains in 1958. He found a wreck in 30 feet of water. The Smithsonian's, Mendel Peterson and the legendary Bermuda diver Teddy Tucker were called to verify the site. They recovered a stone jug, a clay pipe, and a vase and confirmed that they belonged to the period when the original Sea Venture ship had sunk. They also took timber measurements and concluded that this was indeed the vessel that had brought Bermuda's first colonists in the year 1609. 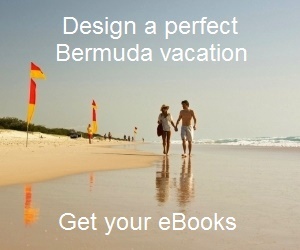 1) Visit Famous Bermuda Shipwrecks to know amazing stories of many other famous ships that have sunk in Bermuda waters. 2) There is a new monument built in St. George Bermuda in memory of the survivors of the Sea Venture. Read Monument for Sea Venture to know the details. 2) Check out Bermuda Triangle Incidents to know about many amazing mysteries of Bermuda Triangle. I have lived in Heacham since 1972 with Princess Pocahontas on the village signpost who married John Rolfe from Heacham April 6th 1614 at Jamestown and his 67 relatives are buried at church -many famous names. I have researched this history for fun since 1997. John Rolfe was shipwrecked on SEA VENTURE on Bermuda 1609 with his first wife Sarah Hacker and their son Bermuda was born there who died and then Sarah too. His John Rolfe family 1580 Geneva bible with their family name and shield inside turned up at Jamestown on their 400th wedding anniversary April 2014 preserved by Rev Seymour Landen with his letter inside at Williamsburg University library... records that must have survived the shipwreck and is the second oldest bible in all of America probably read at their wedding and Pocahontas baptism. I celebrated at Gravesend the 400th Memorial Pocahontas March 21st 2017 with the three Chiefs and 50 Americans at St Georges Church whose church warden said the Sea Venture ship designer was from Gravesend - I was told built at Aldeburgh Suffolk on its maiden voyage in 1609. We all keep in touch and I made them a surprise exhibition of 13 posters and also helped CBN Jamestown with research for their new film POCAHONTAS DOVE OF PEACE in 2015 nominated for three Emmy Film Awards at Los Angeles on April 27th 2017 available from CBN Hereford with lots of excellent commentary from Rappahannock American Indian Chief Anne Nelson Richardson. John Rolfe's family were successful farming shipping family like John Smith and his stepfather from age 9 was wealthy Trinity Cambridge Lawyer Chancellor of Norwich Cathedral Dr Robert Redmayne for 37 years for five Bishops who would also have had ships to visit Sprowston Trowse harbour and his land at Norwich - now used for the Redmayne Cathedral School playing field and Redmayne View retirement home and family housing estate by Windsor Park in Mountbatten Close as Lord Mountbatten's wife Edwina Countess of Burma was also 12th descendant of Pocahontas' great grand daughter Hannah Rolfe explained by the Countess on old 1995 TV history film and in his old letters. We all enjoyed watching the excellent film about Sea Venture shipwreck and how you have identified from size matching plan 9 and the clay pipe and old pottery - thank you. My ancestor Stephen Hopkins also was on the Sea Venture and later arrived in Plymouth aboard the Mayflower where he signed the Contract. I am also a descendant of John Welborn (Wellsbourne) who was on the Sea Venture. Can the wreckage of the original Sea Venture (1609) be reached by any diving opportunities in Bermuda? Original Sea Venture wreck is a restricted site and recreational diving is not allowed there. What is available for dive is Sea Venture Ferry wreck at the Eastern Blue Cut (off the north-western coast of the island and quite far away from the original location)... this was a government ferry which was sunk in October 2007 and made into a dive site. It lies at a depth of about 50 ft. The wreck was named after the original Sea Venture but does not have an iota of resemblance with the original one. It's more like a modern ferry that sits upright. My ancestors, Samuel Jordan and William Bass also survived the 1609 shipwreck of the Sea Venture and continued on to Jamestown. My ancestors were among the shipwrecked.."John Wellborn" who arrived in Jamestown in 1609.